New York drivers have given their implied consent to submit to a chemical test of their blood, breath, or urine if a lawful request is made by a law enforcement officer, who suspects they are intoxicated and unable to safely operate their motorized vehicle in the state of New York. Penalties for either refusing to submit to a chemical test or taking the test and having a blood alcohol content above the legal limit of 0.08% can result in administrative penalties which are separate from the criminal penalties you could face if you are ultimately convicted of drunk driving in New York. 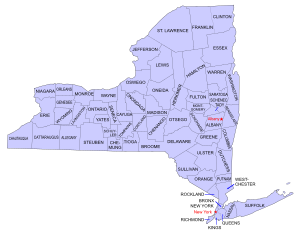 Under New Yorks implied consent laws drivers with a BAC level over 0.08 percent can have their license suspended by the Department of Motor Vehicles in New York for 90 days for the first BAC test failure. What if you refuse the BAC test? Your license can be suspended for one year, and if you refuse again within 5 years you may lose your license for 18 months. You will also face an administrative fine of $500. Note: this suspension is separate from penalties and fines which result from a later conviction of the criminal DUI charges and will still be in effect if the driver is ultimately not convicted of a New York drunk driving charge. For instance, if you are ultimately convicted of DUI in New York you will face fines between $300 and $500, up to 15 days in jail and a license suspension of six months (one year if the drivers BAC is 0.18% or higher). Additionally, the state of New York has imposed what they call a drivers responsibility fee which also requires drivers who are convicted of DWI, or DWAI or refuse to submit to a chemical test to pay $250 for the next three years. Drivers in New York who have their license confiscated because they refused a chemical test or failed the chemical test may challenge the administrative license suspension by requesting a hearing. New Yorks Office of Administrative Hearings manages administrative hearings where the Office of General Counsel will represent New Yorks Division of Licensing Services. Hearings must be requested within a specified number of days from the date of the DUI arrest. The hearing will allow the court to hear the evidence against you and either dismiss the suspension and return your license to you or uphold the administrative license suspension. Some drivers who have had their license suspended think it is okay to driver without a license. Unfortunately, if you are caught operating a motorized vehicle with a suspended license you are facing a much longer license suspension and possible prison term, obviously whether or not you face jail time will depend on why your license was suspended. A first violation is considered an aggravated unlicensed operation charge and if convicted you will be charged with a misdemeanor and face penalties of $200$500, a mandatory surcharge, and possible imprisonment up to 30 days or probation. What if your suspension was due to a conviction of DUI or a chemical test refusal? The penalties will include a mandatory fine of $500$1000, a mandatory surcharge, and mandatory imprisonment of 7180 days or probation.